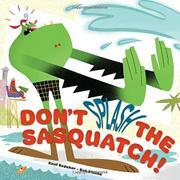 Sasquatch is a weird and wacky critter with a penchant for water; he wants to sit beside the pool, but he doesn’t like to get wet, because it makes his fur “all squizzlefied,” a situation predictably set up for disaster. Lifeguard Blobule gives him permission to take a seat by the pool, but one by one, other large and fanciful critters conspire to break the rule and splash the Sasquatch. Miss Elephant Shark, Mr. Octo-Rhino, Miss Goat-Whale, and Miss Loch-Ness-Monster-Space-Alien all jump in, splashing as much as should be expected from their bulk. Prima donna Sasquatch gets madder and madder, until, as predicted, his hair gets…squizzlefied! Once they realize what they have done, the friends make amends by spinning, shimmying, and styling the offended creature, and they all end up throwing a glorious pool party in which everyone gets wet. The energy and wackiness of the characters are effectively conveyed by Staake’s colorful, computer-generated cutout illustrations, which give the impression of carefully controlled chaos as the figures romp and splash through the pages. There is a hint of a well-used formula here, and the book’s similarity to the previous Don’t Squish the Sasquatch (2012) may leave some readers feeling short-changed.